Credit: Information and images from: "The Fleishmann Yeast Family" by P. Christiaan Klieger, Arcadia Press (2004). The ever genius mind of man was at the height of inventiveness during the Industrial Revolution. The combination of scientific breakthroughs and technological advances of machinery were absolutely necessary for the birth of mass production. This laid the groundwork for some of the greatest innovations that helped shape society today. Being at the right place at the right time coupled with enough entrepreneurial skill and vision could make a person a success beyond wildest imagination; especially in the “Land of Opportunity” as the New World that America had become. Charles Fleischmann was one such individual. The invention of commercially produced and packaged yeast was shortly realized after the organism (a one-celled fungus) had been isolated by Louis Pasteur in the late 1850’s. Saccharomyces cerevisiae is credited as being responsible for one of humanity’s greatest pleasures, as it is credited for revolutionizing the baking industry. 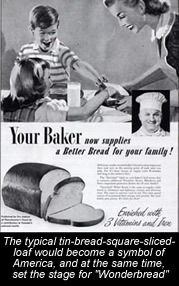 The possibilities for new products became endless and firmly established yeasted bread as a staple diet in North America. The shear drive of success and the ‘Bigger is Better’ philosophy led to the complete exploitation of this tiny organism. Whether it was for better or for worse, we will find out soon enough. 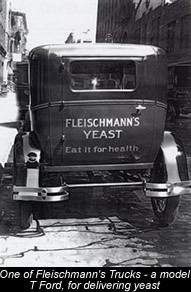 The brand name Fleischmann is deep engrained in the history of commercial yeast fermentation. 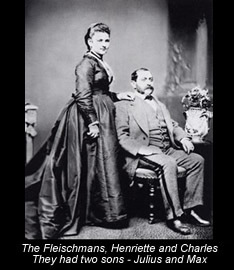 After an initial visit to America, the founder, Charles Fleischmann emigrated and became a naturalized citizen in 1867. He worked in Vienna’s Mautner factory that produced yeast in central Europe and realized that the technology of mass producing good quality yeast at lost costs hadn’t reached America yet. On his return trip to America he brought back a vial of pure yeast strain and thereby established the first industrialized yeast factory in North America. 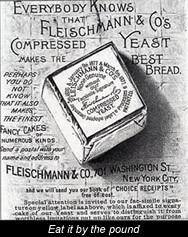 Mr. Fleischmann, having been the yeast production superintendent of a nobleman’s distillery in the old country was quite familiar with the different processes and took the yeast manufacturing invention to exponential heights in the new world, and within twenty years had become one of the richest and influential men in America. This new process became known as the Viennese production of yeast, and is still used today as the industry standard. From a single yeast cell it is possible to produce 40 tons of pure yeast within 10 days. It is needless to say that the profit potential was enormous in light of such yields. Historically, bakery products were much more limited in variety and fermentation was mainly achieved by the sourdough method, which involved using the excess yeast that was produced during the brewing of beer or distillation alcohol. This is why the baking and brewing crafts have had such an intimate relationship from ancient times. Mr. Fleischmann patented several of his own inventions in the United States, and together with his brothers Max and Henry, they built an empire based on fermentation in the industrial heartland of America. In 1870 they built the first yeast plant adjacent to the Baltimore and Ohio Railroad and Ohio River at Riverside, just outside Cincinnati. This facilitated rapid transport of raw materials and finished products. At first sluggish to start with, their yeast market turning point came when the Fleischmann brothers attended the Centennial Exposition held in Philadelphia from May to November of 1876. This world fair was a celebration of the arts of the Industrial Revolution, and attracted 10 million visitors. With his Vienna model bakery concession where Mr. Fleischmann demonstrated the yeast leavening process, baked bread, and Viennese pastries, he provided the platform that catapulted the Fleischmann dynasty into the future. From this time on advertisement became a vocal point and tool of marketing and shaped as well as symbolized the new marketing strategy of modern business. Since then these strategies have exploited children and family values to the extreme; there are no limits set and unethical sales gimmicks abound with no sanctities whatsoever. By the 1890’s Charles Fleischmann had four production plants, several luxurious vacation homes, a yacht, a stable of racehorses, and was a state senator. He was also close friends with William McKinley, who eventually became president of the United States from 1897 to 1901. The enormous mansions built one after another in the following 50 years by the Fleischmann dynasty were truly astronomical, and all based on this microscopic organism. 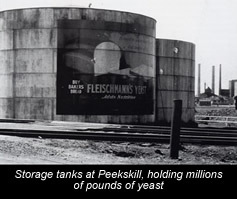 In 1900 the gigantic Peekskill factory at Charles Point on the Hudson River, New York, was built and employed close to 1,000 employees producing train loads of gin, huge amounts of vinegar and other products in addition to millions of pounds of yeast. 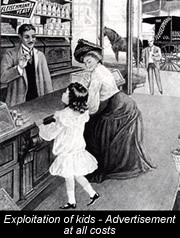 In 1905 the Fleischman Company had 12 plants, employed 1000 salesmen servicing 30,000 bakeries, and 225,000 grocery stores. 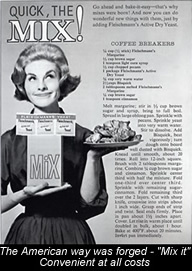 The exploitation of the yeast cell culminated into the eventual marketing of yeast cakes for direct consumption by the public. The marketing campaign involved heart-rending testimonials from consumers, as well as authoritative prescriptions by European doctors for diverse ailments such as teenage pimples, intestinal disorders, natural laxatives, and purifiers, etc. Even a radio Fleischmann hour ran from 1929 to 1939 and became very popular. A questionnaire survey of 30,000 American doctors showed that nearly half said they had prescribed yeast at some time or another, which became the physician-touted “purification by yeast”. This run-away blasphemy finally came to an end when these claims were examined by recognized health authorities. Modern yeast allergies are very common and it leaves one wondering about the connections to the abusive intake of pure yeast in the past and the overload of yeasted products of today. 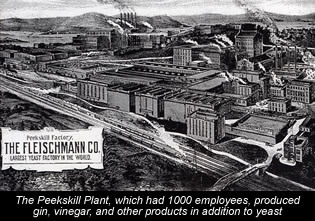 However, the name Fleischmann became synonymous with the ascent of America, and by 1938 the company served 60,000 bakeries and restaurants, and 300,000 grocers with a fleet of 3,000 vehicles. The most pressing thought for any health conscious person of today will surely be to recognize the absurdity and abusive nature of this propaganda marketing activity employed. Modern consumerism did not only manifest itself over night but has its roots deeply engrained in the history of this yeast explosion. The various problematic foods for people are foods that are over processed and based on non-traditional methods of preparation. As with every other invention the question arises as to how beneficial it has been in the long run, and if it truly improved anything. 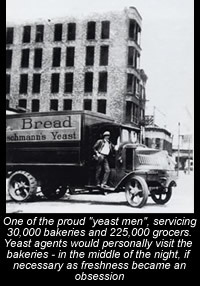 The invention of mass-producing only specific yeast strains was inarguably one of the most significant inventions that shaped the foods we eat today. In today’s bakery straight yeast bread and the numerous items based on sweet yeast doughs are eaten in incredibly large amounts. With the wide availability of bakers yeast, baking transformed from a craft to a much more commercially exploited industry, to say the least. In combination with the newly industrialized mass produced products of sugar and fat the industry exploits the taste buds of mankind, seeking only to make relevant purses fatter with money. Maybe it was just a short fling of favoured indulgence in these masterfully advertised foods of the Industrial Revolution. Now is the time to take stock and revert back to a more traditional diet that is not alien to us, and promotes healthy living instead. Technological achievements are great, but if we have learned anything from the past we have to be much more prudent in employing them in the mass production of anything. They need to be analyzed much more carefully, and not be handed to the will of unscrupulous entrepreneurial exploitation.